Welcome to my May 2018 Marin County Real Estate Market Report! The market is in full-swing and it is the most exciting time of year for those of us who live and breathe real estate. Home buyers are out in full force, and sellers are seeing well-priced and well-presented homes go quickly. Pictured above is my listing 134 Madrone in San Anselmo, which I sold in one day off market for $50,000 over asking. I am seeing more pocket listing activity on Top Agent network than this time last year. While it's impossible to know the percentage of off-market sales to the total, I believe it is a healthy number. Properly preparing a home for sale can make a big difference in how that home is received by buyers and ultimately how much they are willing to pay for it. Even in a sellers' market where there is a great deal of competition for homes, this is still a wise investment and can yield large dividends. Given my background in design and marketing, this is one of my specialties and I thought I would share a case study to illustrate my point. Welcome to my March 2018 Marin County Real Estate Market Report! Spring is right around the corner and with that the big season for Marin home buyers and sellers. We are seeing more inventory coming on the market every day after a sleepier-than-usual February that saw fewer sales than the same month in 2017. You will notice something very different in the charts this month. Each month we see green arrows on the pricing chart, indicating price increases from the prior month, and we see red arrows on the inventory chart, reflecting tighter and tighter inventory in the Marin County real estate market. However this month we see prices have declined from the prior month and inventories are up. 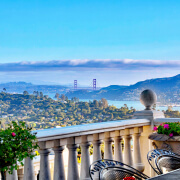 Golden Gate Sotheby’s International Realty, Marin County’s premier brokerage, today announced that Thomas Henthorne is the #1 ranked agent in Marin by volume for 2017. 2017 was a great year for sellers in Marin and we saw a lot of movement in the upper end of the market in all areas of the county. San Rafael in particular made great strides in the high end market this year. For years, I have heard other real estate agents say that homes priced greater than $2mm in San Rafael will be a "tough sell." This past year certainly proved that this is no longer the case. Wondering about the most expensive homes sold in Marin County in 2017? You've come to the right place! The top end of the Marin County real estate market again saw a strong year with some very noteworthy transactions. The full diversity of the Marin real estate market is on full display with homes in the top 10 ranging from modern hillside estates to historic seaside ranches. California Earthquake Insurance | Should You Buy It? Friends and clients often ask me “Do you have earthquake insurance?” so I thought it might be a good idea to write a blog article about this topic. Insurance is one of those things we pay for and hope we never need to use. However watching the recent weather-related calamities in Texas and Florida, as well as the fires just to our north and the fires this week in the Los Angeles area, it is on a lot of people’s minds these days. https://i2.wp.com/www.thomashenthorne.com/wp-content/uploads/2017/11/California-Earthquake-Map-1.png?fit=1274%2C993&ssl=1 993 1274 Thomas Henthorne https://www.thomashenthorne.com/wp-content/uploads/2016/03/logo-1.png Thomas Henthorne2017-12-07 08:02:222018-01-09 16:05:06California Earthquake Insurance | Should You Buy It? Last week’s announcement of the Equifax data breach has caused great concern for clients and friends who have questions about identity theft. While I normally focus on local lifestyle and real estate articles in my blog, I thought I would make an exception given the gravity of the situation and the potential impact to your ability to qualify for a home loan in the future.